CRYSTAL GROTTOES CAVERNS HAS MORE FORMATIONS PER SQUARE FOOT THAN ANY CAVE KNOWN TO MAN, AND IS THE MOST NATURALLY KEPT CAVE IN THE WORLD. The Crystal Grottoes Caverns were founded in 1920 when the State Roads Commission was quarrying for limestone to build up and pave State Route 34. After successfully quarrying back a cliff that was 35 to 55 feet high and 150 feet deep, an unusual event occurred. The next time they started to drill, they lost their drill bits in the cave. 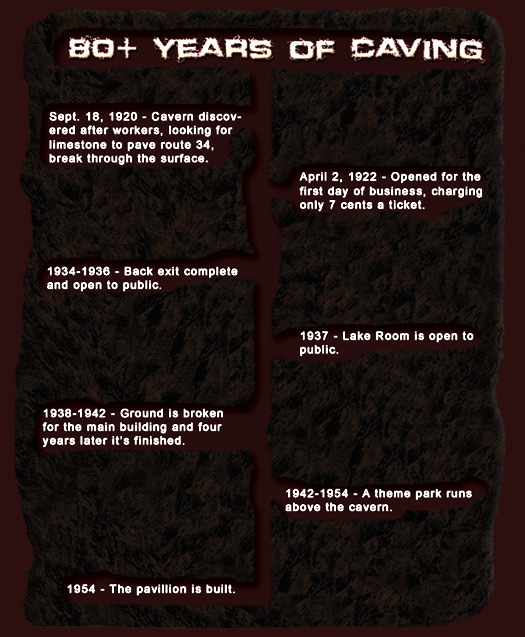 Later, when dynamite was detonated in the drill holes, the first entrance was produced.